Be it nuclear, fuel cell or even solar, as the source of electricity, mass is being expended in the form of electrons. (Solar is taking advantage of the Sun's own expendature of mass in the form of photons). Whiloe the quantity of mass being expended is minute, it IS being expended. The needed power for the EM Drive (to escape the surface of the Earth, or anything else you want the spacecraft to do) depends on your frame of reference. As Paul March himself admitted, for their Quantum Vacuum explanation for the EM Drive to hold, they need to disrespect the mainstream physics assumption that the Quantum Vacuum is indestructible and immutable. Bottom line: no, "according to basic physics, it should" not be possible to directly convert electrical energy into a spacecraft's momentum change without any change in mass of the spacecraft (or the action of external forces). If the EM Drive were to work for space propulsion, it certainly would not be explainable in terms of mainstream physics where conservation of momentum is paramount, and the Quantum Vacuum is both indestructible and immutable. Just being curious: What, in your book, would be the most important theoretical consequences of the discovery of a different QV nature? If the QV is not immutable and indestructible, the theoretical and practical consequences would be so groundbreaking that they would make the 20th century's discoveries of atomic and nuclear energy pale in comparison. We've not tired to make that a secret and in fact that is at the core of our Q-V conjecture and Q-V plasma code that Dr. White and Dr. Vera have written that produced the Q-Thruster thrust predictions that I posted earlier on this forum. And this new paper is an expansion of Dr. White's STAIF-2007 conjecture and a partial rebuttal to the criticisms raised by the NASA Blue Ribbon panel's critique from last summer, an independent body of eight PhDs knowledge in the field that was created by NASA/JSC/EP management to vet Dr. White's QVF/MHD conjecture. And yes, if the accumulated chemical and nuclear data keeps pointing us in the same direction as it and our own experimental data has so far, we will be able to transmit and receive momentum through the Q-V via Q-Thruster like device. AND ultimately, be able harvest energy from the Q-V based cosmological gravitational field via various thermodynamic processes, at least in the far term. So find attached the Abstract and Introduction of our "Dynamics of the Vacuum" paper that will be out on the NASA servers hopefully by the end of April. "One should not take this vacuum energy too literally, however, because the free-field theory is just a mathematical tool to help us understand what we are really interested in: the interacting theory. Only the interacting theory is supposed to correspond directly to reality. Because the vacuum state of the interacting theory is the state of least energy in reality, there is no way to extract the vacuum energy and use it for anything. "Similarly, one should not get one's hope up when people talk about vacuum energy. It is just how we do our bookkeeping in quantum field theory. There is much more to say about why we do our bookkeeping this funny way, but I will stop here. Can you point out people in academia that also think that it may be possible that the Quantum Vacuum is not immutable and indestructible, (whether based on higher dimensional branes using string theory or based on other theories)? Sonny White formulated a compressible quantum vacuum conjecture that requires us to live in a portion of the universe that is immersed in a false vacuum that apparently has a ground or zero-energy level much smaller than science first assumed. However what will drive this debate is experimental data first and foremost. Experimental data like what just came out of the Eagleworks Lab's latest warp-field interferometer tests based on 27,000, 1.5 second long on/off data samples that indicates we have finally observed the first spacetime contraction effects that we are fairly confident are the real deal. We again are looking for more possible false positives as well as ways of increasing the signal to noise ratio above its current ~2-to-3 sigma level, which I've already suggested several ways to do so to Dr. White. However what is really interesting about these new test results is that the laser interferometer observed spacetime contractions are being developed in a TM010 RF resonant cavity that is driving ac E-field levels over 900kV/m at a 1.48 GHz rate. A similar RF resonant system used to implement the EM-Drive and Q-thruster designs, for these spacetime contraction effects are paramount to the operation of both. BTW, we have also started the build of our 1.2kW magnetron powered EM-Drive prototype in a tetter-totter balance system that is being built to replicate the thrust magnitudes of the Shawyer tests and the Chinese replication of same. Estimated build time should in the 2 month time period with the limited manpower available. A picture of the chaotic magnetron spectra that will be used on this system is attached along with the TE011 mode that will be driven. Since it couples electromagnetic radiation in dielectrics with quantum phenomenon. We report our observation that radiation from a system of accelerating charges is possible only when there is explicit breaking of symmetry in the electric field in space within the spatial configuration of the radiating system. Under symmetry breaking, current within an enclosed area around the radiating structure is not conserved at a certain instant of time resulting in radiation in free space. Electromagnetic radiation from dielectric and piezoelectric material based resonators are discussed in this context. Finally, it is argued that symmetry of a resonator of any form can be explicitly broken to create a radiating antenna. I haven't had any luck finding an online link to the paper itself. It wouldn't surprise me if it turned out to be on a paid for service somewhere, in my limited experience that seems to be the case when you can only locate abstracts. One of the things to keep in mind while building the new setup, is to have the ability to change the Q factor. I don't know if you can already factor it in now, or that it would be better to keep that for a later phase? Great find! And it may provide another way to excite METs, EM-Drives and Q-Thrusters. "Can you point out people in academia that also think that it may be possible that the Quantum Vacuum is not immutable and indestructible, (whether based on higher dimensional branes using string theory or based on other theories)?" I have several papers at work that may satisfy your quest and I'll bring them home this evening to upload them to NSF. In the meantime here are a couple of papers that are at least related to your question. "In the post-war era the magnetron became less widely used in the radar role. This was due to the fact that the magnetron's output changes from pulse to pulse, both in frequency and phase." "Phase is almost never preserved, which makes the magnetron difficult to use in phased array systems. Frequency also drifts pulse to pulse, a more difficult problem for a wider array of radar systems." How would this phase instability affect this kind of system? the risk is to get incoherent data. The post is reply 38 in that thread. It's about the implicit negative mass that should have to be involved in turning positive mass particles into zero mass meta-particles called unparticles in the literature. I would appreciate your thoughts (because there are some heavy hitters in this thread) but over there so as not to further disturb this thread. In a particle detector, unparticles would look like particles with random masses. One unparticle decay might have many times the apparent mass of the next — the distribution would be broad. Also keep in mind that this unparticle stuff is still a theoretical conjecture and that such unparticle stuff has not been verified in experiments. "I only have a minor in physics so I honestly can't understand most of what's talked about here, but I know at the least you can't go about thrusting around the universe with no particles/energy leaving the engine without something like an Alcubierre drive. Even if you're pushing against quantum virtual particle pairs, virtual particle pairs have opposite signs so will be propelled in opposite directions thus canceling out any net force." 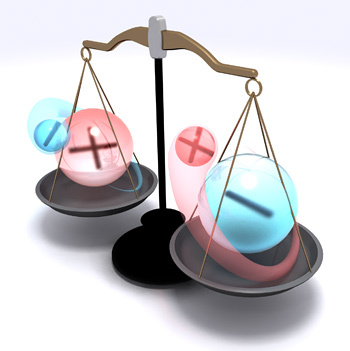 In a neutral plasma there is an equal number of plus and minus electrical charges or ions that can react to applied E-fields and B-fields in various ways. If there is only an electric field applied to the plasma volume then yes the positive charges will go one way and the negative charges will go in the opposite direction. However if we apply a spatially crossed E-field and B-field across this volume, then we have a Lorentz force produced on the plasma ions that is at right angles to the applied E-field and B-field. Then BOTH the positive and negative ions will be accelerated in the SAME direction, but with counter rotating twists AKA Gyro radius modifying their accelerated trajectories. All of these EM-Drive like thruster utilize some form of this Lorentz force acceleration on some type of propellant, be it real as in a Hall thruster or semi-virtual. Playing devil's advocate, I've spent two days researching this but I simply can't find any evidence which can support that virtual particles can be accelerated and used as propellant in this fashion. Evidence from multiple sources suggests treating virtual particle pairs as a plasma to be accelerated by the Lorentz force is not possible. In addition, the Lorentz invariance of the QV precludes this. Every resource I can find tells me that virtual particles are not on mass shell, are not subject to the classical equations of motion, and can't be accelerated by the Lorentz force. Concerning the issue of Lorentz covariance, Paul March has pointed towards multi-dimensional branes in string theory and multi-vacuum states. In quantum gravity, there doesn't seem to be a single unique observer-independent notion of a quantum gravity vacuum state (examples: the Unruh effect and Hawking radiation), hence no Lorentz covariance. Perhaps in quantum gravity the whole family of states taken together are Poincare invariant or invariant under a higher group. Even if this would be the case, I don't understand how these (otherwise inaccessible extra dimensions of string theory) multi-vacuum states would be accessible with simple EM Drive experiments: they involve comparatively low energies (we are not dealing with a particle accelerator and much less with a black hole), they are conducted at room temperature, and they involve electromagnetic standing waves and therefore the Poynting vector is constantly switching sign at a frequency twice as high as the frequency of the electromagnetic fields in the EM Drive. Therefore this stress-energy tensor component Too has no preferred direction in space. Where does the directionality in space come from in Dr. White's computer model ? Then, the Too component of the energy-stress tensor is equivalent to the σxx component in this image. One can see that the σxx component is pointed in the x direction and it has no directionality along y or z coordinates (which are perpendicular to it). Similarly, the energy density Too is pointed in the time direction: it has no directionality along any of the space coordinates. I just thought this graphic might be interesting for some. Hopefully it's correct... i think. It just illustrates the resonating waves as traveling waves and sort of illustrates how they can alter from B max to E max or in-between. I found it interesting that doppler shift in the cavity, when it starts moving, should give the bouncing light a poynting vector indicating the light and cavity are in motion relative to the moving frame observer. Another thought is, what if the waves in the cavity are experiencing some change in velocity? Why would this happen? The thought goes back to the Casimir Force on two plates where radiation of wavelengths larger than a specific length can't exist between the plates. I can't quite remember where but I thought I read that tunneling was thought to happen faster than light across the plates and one explanation was the dielectric constant of space between the plates had changed to give space an index of refraction smaller than that of free space and so the light jumped the gap faster than light. So what if the cone shaped cavity could be slightly modifying the speed of light inside the cavity in a similar manner to the Casimir effect (narrow end as opposed to the larger end)? Quote from site:"NASA Lewis Research Center Breakthrough Propulsion Physics Workshop (January 1999). Dr. Raymond Chio, in the Physics Dept. of the University of California-Berkley, has reported observation of a photon tunneling through a barrier at three times the speed of light. "<-- "I believe faster-than-light tunneling times can be predicted and accurately controlled, without the need for a barrier, by both extending wave properties of a photon past its energy barrier, and using capacitive reactance phase shift correspondence, with related timing constants." If so then maybe a change in light velocity would offset the phase of transformations from B to E inside the cavity? So is Dr White claiming that his interferometer is detecting a path-length difference resulting from an applied voltage on a capacitor ring? Thanks so much for taking the time to dig and post these papers. The new paper by Bush (2015) from MIT, showing that one can model quantum statistics hydrodynamically, is outstanding, very clearly written. "Quantum Vacuum and Virtual Gravitational Dipoles: The solution to the Dark Energy Problem?" "Virtual gravitational dipoles as alternative to cosmic inflation in the primordial Universe"
Based on our data, we can exclude the possibility that the gravitiational mass of antihydrogen is more than 110 times its inertial mass, or that it falls upwards with a gravitational mass more than 65 times its inertial mass. Our results far from settle the question of antimatter gravity. But they open the way towards higher-precision measurements in the future, using the same technique, but more, and colder trapped antihydrogen atoms, and a better understanding of the systematic effects in our apparatus. 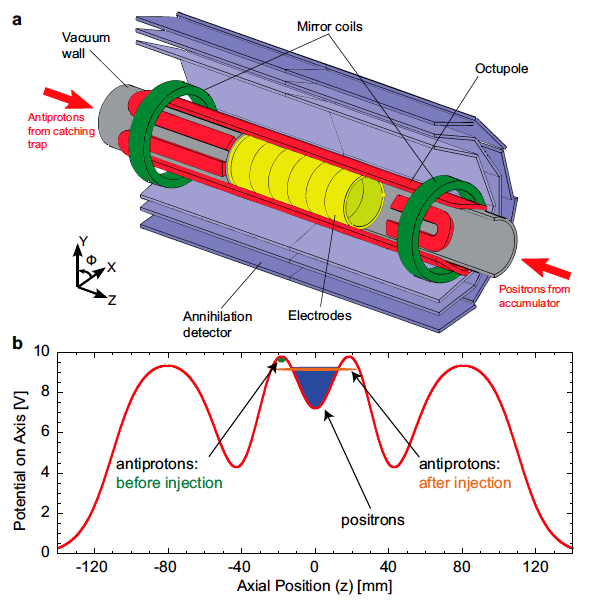 antihydrogen, Nat. Commun. 4 (2013) 1785. Talking of CERN will the LHC be able to help with any of this? I know they are using it to see if they can prove if super-symmetry exists. No, this is not directly related to the LHC (except that they get the antiprotons from a particle accelerator). The CERN ALPHA experiment uses instead a magnetic trap (http://en.wikipedia.org/wiki/Magnetic_trap_%28atoms%29), a Penning trap ( http://en.wikipedia.org/wiki/Penning_trap ) and an anhilitation detector (Silicon Vertex Detector http://en.wikipedia.org/wiki/Particle_detector ). In the Penning trap charged plasmas of positron, antiproton and electrons are confined in a superposition of magnetic and electric fields. The Plasmas are axially confined in the Penning trap by quadratic electric potentials. Charged particles in the trap travel in the direction of the magnetic field lines and cannot escape outwards, or perpendicular to the field. The potentials in CERN's ALPHA experiment are produced by the application of DC voltages to a stack of hollow cylindrical electrodes. (This is in direct contrast with the EM Drive because it uses DC voltages, in contrast with the use of GigaHertz AC electromagnetic standing waves at room temperature in the EM Drive !!!! ). In the trap, positron and electron particles are subjected to the Lorenz force. The Lorenz force deflects particles perpendicular to the magnetic field, causing them to spiral around magnetic field lines. The ALPHA trap electrodes are mounted inside of a vacuum chamber surrounded by a liquid helium cryostat ( http://en.wikipedia.org/wiki/Cryostat ). Notes: Because antihydrogen is neutral, it cannot be held in a traditional Penning trap. Therefore the ALPHA experiment uses a non-traditional Penning trap. Positrons implanted into solid material typically have a lifetime less than one nanosecond, a thousand millionth of a second. However, during that brief time most will slow down by a variety of energy loss processes to reach kinetic energies close to those characteristic of the temperature of the solid. This process is termed moderation, as the positron’s kinetic energy is lowered, or moderated. Whilst most of the positrons penetrate deep into the bulk of the material and annihilate there, about 1% stop close enough to the surface that they can diffuse back to it before they annihilate. Incredibly, most of the positrons which reach the surface are emitted into vacuum at low energy, and can be readily formed into a beam and transported, typically using magnetic guiding fields. ALPHA uses a solid film of condensed neon as its moderator; this is one of the most efficient positron moderators. Another very good test some readers may want to look up, which we do not have space to describe here, is the Casimir effect, where forces between metal plates in empty space are modified by the presence of virtual particles. Thus virtual particles are indeed real and have observable effects that physicists have devised ways of measuring. The assumption that the Quantum Vacuum is indestructible and immutable demands that virtual particles are exactly the same as real particles because of the experimental observation that a fundamental particle like an electron (or a positron) has the same properties (e.g. mass, charge or spin), regardless of when or where the particle was created, whether now or in the early universe, through astrophysical processes or in a laboratory. The photons created by the Chalmers scientist, Christopher Wilson and his co-workers, who succeeded in getting photons to leave their virtual state and become real photons, are indistinguishable from real photons now and here, or photons from the early universe arriving to us. Particles like photons, electrons, positrons, protons and antiprotons don't come with tags reading "virtual" or "real", they don't have hair, or any distinguishing features from each other. What I have a problem seeing is how the very low power electromagnetic fields in the EM Drive operated at room temperature, and the fact that the electromagnetic fields in the EM Drive are standing waves whose Poynting vector is changing direction at a frequency twice as high as the operating frequency, can result in thrust from the vacuum acting like a positron/electron plasma. And I also don't see how Dr. White's computer code can get a directional thrust from the energy density, which, as I discussed is a scalar component with no direction in space ( http://forum.nasaspaceflight.com/index.php?topic=36313.msg1355995#msg1355995 ). excuse me but isn't the laser thing is an accomplished fact now? A few years ago there was a couple of related articles on a desktop accelerator that generated electrons and positrons then separated them with magnets. here is one of them and then there were two more. the third talks about (the rapidly approaching future ability) using colliding laser beams to create matter out of photons.